Some things just go together: peanut butter and jelly, salt and pepper, owls and napkins. 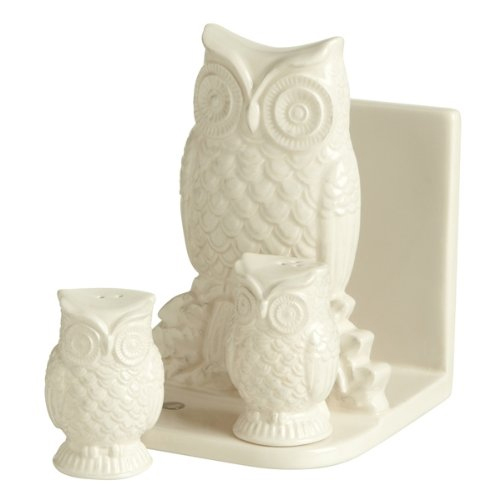 The Grasslands Road Owl Napkin Holder With Salt & Pepper Shakers Gift Set understands. Well, the last two on the list at least. The owl-shaped accessory stands guard over the tabletop, holding napkins and at the ready with salt and pepper. Featuring magnetic inserts to keep the little owls in place, the set is sure to find daily use. And considering how many napkins messy peanut butter and jelly sandwiches require, perhaps the wise old napkin-holding owl does understand that too.